so im a little fed up with paying the huge overhead cost attached to mainstream phone manufacturers (ahem! samsung) because it does NOT cost anywhere near $700 to manufacture one of these things. soooo enter the florida based blu products. bought my wife a blu studio 5.0LTE and we have been using it for a month and the phone is spectacular. so much so that im thinking about getting a blu myself but i want to get some feedback first. based on your opinion what is the best blu for under $200 right now? The downside I see to them is most barely have enough storage for the Android OS, let alone anything else. I am honestly not sure what to suggest for devices under $200. The bloat issue can also depend on the device. My Moto X and Nexus had very little bloat on them. Once my M8 had an AOSP ROM flashed all the bloat was gone. The Studio has 8 GB, so that would make about 4 GB usable. That is far too little for what I use my devices for. As for the apps to the SD card, some of the data would go to the card, but not all of it. I prefer to install all apps on internal memory myself, but to each his own. Strange...the link you posted is correct, but I looked at the list, and there was a rollover effect that showed some of the specs. That was how I got 8GB. A blu studio 5.0 lte costs ~$150. The Samsung Galaxy Avant runs $200 and is better spec'd except screen is a bit smaller. 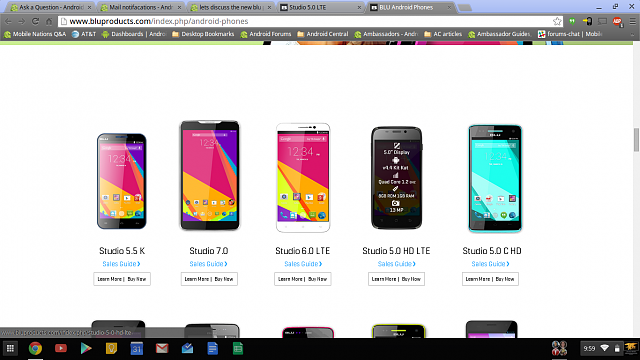 Comparing the blu studio 5.0 lte to a Samsung Galaxy Note 4 isn't really fair. One is a lower end phone, the other is the latest high end phone. Why is my phone acting wierd? Why doesn't my phone have a signal? The camera on my S5 is suddenly upside down, how do I set it back?